This is a scalable context timeline. It contains events related to the event May 16, 2008: Bin Laden Possibly Releases Audio Message about Palestine. You can narrow or broaden the context of this timeline by adjusting the zoom level. The lower the scale, the more relevant the items on average will be, while the higher the scale, the less relevant the items, on average, will be. 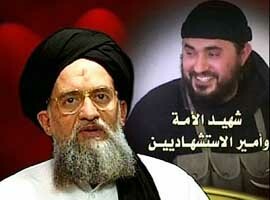 Al-Qaeda deputy leader Ayman al-Zawahiri also mentioned the death of Abu Musab al-Zarqawi in a video. [Source: As Sahab]A man said to be Osama bin Laden releases an audio message following the death of Abu Musab al-Zarqawi, who was said to be head of al-Qaeda’s franchise in Iraq (see June 8, 2006). The voice says that al-Zarqawi, who died following a US air strike, is “one of our greatest knights and one of our best emirs… We were very happy to find in him a symbol and role model for our future generations.” The voice, which the CIA says is bin Laden’s, also asks that al-Zarqawi’s body be returned to Jordan, where he was born. The speaker also says: “We will continue, God willing, to fight you and your allies everywhere, in Iraq, Afghanistan, Somalia and Sudan, until we drain your money and kill your men and send you home defeated, God willing, as we defeated you before, thanks to God, in Somalia.” The message lasts almost 20 minutes and is posted on a website associated with al-Qaeda. [CNN, 6/30/2006] Al-Zarqawi pledged loyalty to bin Laden in 2004 (see October 17, 2004).